HAPPY HALLOWEEN, the time for Ghost Pokemon to haunt us all and for everyone to dress up in costumes to creep about spooktacular houses to retrieve the sweet confections! And what better way to celebrate it than to talk about one of the scariest deck archetypes that the game’s ever seen: Night March!! 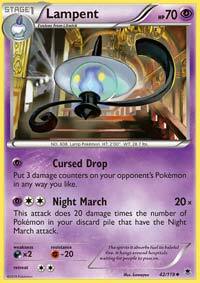 Night March is specifically brought up from the Night March attack, which lets the Pokemon using it deal 20 damage for every Pokemon in your discard pile with Night March. There were only ever 3 Pokemon that even had the Night March attack – Joltik, Lampent, and Pumpkaboo, all from the Phantom Forces set – and as a start, it seems like one of those decks in the vein of Round, in which it centralizes around a single attack and limits the deckbuilding options around it to work on a fairly underwhelming move. However, that didn’t end up being the case with Night March for several reasons. Lampent is a Stage 1 Psychic Pokemon, 70 HP, with a Dark Weakness, a Fighting Resistance, and a Retreat Cost of 2. Cursed Drop isn’t that interesting in and of itself, and it’s largely overshadowed in light of Night March. Its own Night March attack costs 3 Energy, one of which needs to be Psychic. Lampent is primarily used as fodder for other Night March attacks, as it’s not only slower than the other options, but it requires a specific Energy in order to use the attack, unlike the other Night March users. Pumpkaboo is a Basic Psychic Pokemon, 60 HP, with a Dark Weakness, a Fighting Resistance, and a Retreat Cost of 2. Ram is a 1-for-10 vanilla strike not worth talking about, and its Night March attack also costs 3 Energy, albeit without the Psychic requirement. It’s a little better than Lampent, coming out a bit sooner and being capable of actually attacking with Night March. However 3 Energy is a lot to utilize and can’t be equipped all in one turn, which means that Pumpkaboo is typically used as fodder as well. Joltik is a Basic Lightning Pokemon, 30 HP, with a Fighting Weakness, a Metal Resistance, and a Retreat Cost of 1. 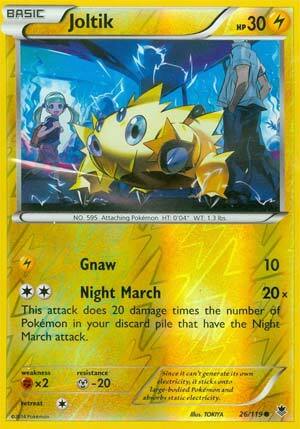 Again, Gnaw isn’t worth talking about, but its Night March attack only costs 2 Energy of any kind. What this means is that Joltik could be equipped with a DCE and immediately be able to attack with Night March, unlike Lampent and Pumpkaboo, and it’s hilarious to see one of the scariest Pokemon in the game with only have 30 HP. The deck saw a lot of help in fueling up the discard pile with cards like Battle Compressor and Professor Sycamore, attaching a Muscle Band onto Joltik to make things even easier, and ultimately pushing the boundaries of what could ultimately survive a Night March attack. 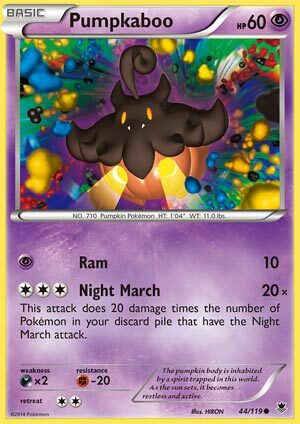 At its strongest, Night March can deal a whopping 220 damage – based on 4 Lampent, 4 Pumpkaboo, and 3 Joltik, using the last one to attack – which was more than enough to OHKO anything in the game that wasn’t a Mega Pokemon-GX, and even nowadays you need to be a Stage 2 Pokemon-GX to have a chance at surviving it at full power. However, now we have a new Tool to be utilized in the Night March deck that’s even scarier than Muscle Band: Hustle Belt. Attached to Joltik, Hustle Belt lets the Night March attack deal 60 more damage, or the equivalent of 3 Pokemon with Night March, and it cements that Joltik is the massive attacking behemoth of the deck despite being so small. That means the attack could do upwards of 280 damage at its highest, more than enough to OHKO everything in the game. That does require a lot of set-up, of which Night March has access to several different tools in Expanded in order to do so, and it’s likely to become one of the scariest decks in the format because of these new additions. In fact, we’re likely to see Night March expanded upon once Lost Thunder comes out, as there’s another card that can help them out with the strategy too! As long as there aren’t any sets that will leave the Expanded format, it’s likely that Night March will remain a large part of it. Even with all of the new Pokemon coming out, even with all new Items, and even with the general power creep that the game’s progressing towards – I mean, have you heard of Tag Team-GX yet? – Night March will likely remain a tremendously large part of the format, shaping and defining it for anyone looking to expand their gameplay. Arora Notealus: Night March has made a substantial impact on the game, and it remains one of the strongest deck archetypes in the Expanded format. Of course, being reliant on a Pokemon that blows up with a light breeze can be tricky, but against a lot of decks, you can afford to get extremely aggressive with Night March, taking huge KOs in exchange for only losing 1 Prize at a time. It’s a rapid-fire playstyle, but if you can master the deck, then it shouldn’t take much to finesse it in your favor. The cards are also pretty easy to get, so give it a whirl if you’re looking for a strong deck! Just be aware that it’s been around for years, so a lot of people will have major counters packed away for it. Next Time: Soaring through the sky, a messenger arrives! Today’s Halloween theme for Pokémon is…The Night March Crew! This is an archetype consisting of three cards: Joltik, Lampent, and Pumkaboo. All three are from XY Phantom Forces and carries the attack called Night March, which does 20 damage times the number of Pokémon in the discard pile with the Night March attack. I’ll link to the previous review of those collective because the review crew made a wonderful essay regard those cards when the crew looked at the 4th best card lost to rotation in late 2016. I encourage you to read this past review because most of what the review crew said still applies to the Expanded format. This used to be a good budget deck, but struggles due to how much work it takes to get there, power creep, and Karen. Some factors can be mutually exclusive or related. Since there’s only 12 Pokemon cards with the Night March attack, and that one of them has to be in play while the other 11 are in the discard pile, the damage output becomes 220. Night March can no longer KO any Pokemon consistently without external help, whether it be Professor Kukui, trying to meet Hustle Belt’s requirement, or Electropower for Joltik, because the new Max HP is 270 due to Snorlax and Eevee GX possessing this much. Karen, a Supporter card that puts both player’s Pokémon from the discard pile into their decks, pretty much eliminated all the damage output that Night March would’ve deal due to Night Marchers no longer in the discard pile. Joltik is used frequently as an attacker than Pumkaboo, so Buzzwole-GX can knock out two Joltiks in play; other spread attackers can be a problem as well. When you factor in those shortcomings that will most likely make it hard for Night March to make a comeback, it sends a message saying that the deck is not worth using anymore, and will continue to not generate returns if you keep trying. Even with a wonderful partner of Marshadow-GX – that would have OHKO two of those Tag Team GX due to Fighting Weakness, backed with six night marchers and Choice Band – won’t offset the counter that Karen performs. In the end, This was a good Throwback to be taking about because we have another archetype in Lost Thunder called Lost March. But…….I’ll save this for another time! Standard: N/A (would be 2/5. Assuming the Night March trio would be reprinted, Karen won’t be in this format, helping the deck maintain high damage outputs. I have yet to see another card that does similar to Karen. Even then, HP keeps on inflating.). Conclusion: This may seem over dramatic because I weighed in those shortcomings somewhat heavily, but this is still things to watch out for, otherwise the deck will be stopped cold. And whether you choose to cope with a strategy being wrecked is totally up to the player: pick up the pieces or concede. Welcome to our Halloween Triple Feature! Today we are reviewing Joltik (XY – Phantom Forces 26/119), Lampent (XY – Phantom Forces 42/119) and Pumpkaboo (XY – Phantom Forces 44/119). Whether you call them the Night March Crew or Night March Trio or the Night March Pokémon or the Night Marchers or something else, they are famous (or infamous). Yet, some may not know these three, as they have not been Standard legal for a little over two years and even their presence in the Expanded Format has waned since its epic high. You can read our review of Joltik here or our previous three-in-one review of the Night Marchers here. You can even laugh at some embarrassing mistakes I made! Those who know Night March decks tend to love or hate them, often for the same reasons: it is a deck built around Evolving Pokémon (two Basic, one Stage 1) that can hit hard and fast, but which requires constant course adjustment against a savvy opponent. Those who say it is boring to face have a point; when facing Night March you only see the end results of your opponent’s thought process. Those who say it is brainless have either only faced opponent’s who don’t know how to play it properly, don’t know how to effectively face it without actual counter cards, or have an elitist bent. We’ll begin discussing these three by quickly running through the card fundamentals before tackling related cards while explaining history, the present, and the future of Night March decks. Joltik is a [L] Type Pokémon with 30 HP, [F] Weakness, [M] Resistance, Retreat Cost [C], the attack “Gnaw” for [L] doing 10 damage, and the attack “Night March” for [CC] doing 20 damage times the number of Pokémon with Night March you have in your discard pile. Lampent and Pumpkaboo are both [P] Pokémon with [D] Weakness, [F] Resistance, Retreat Cost [C], and the same Night March attack as Joltik but with different costs: [PCC] for Lampent and [CCC] for Pumpkaboo. Lampent is a Stage 1 with 70 HP and the attack “Cursed Drop” for [P], letting you place three total damage counters as you wish on your opponent’s Pokémon. Pumpkaboo has 60 HP and knows the attack “Ram” for [P], which does 10 damage. Though all three Night Marchers are Evolving Pokémon, Night March decks typically don’t run Chandelure, Galvantula, or Gourgeist. Players have tried to see if it would work, but whether including all three or just one of them, the Evolutions just don’t add enough to be worth the deck space. The deck doesn’t run Litwick, either; Lampent exists only as discard fodder, the only relevant aspects of it being that it knows Night March and – if running something like Level Ball – its HP. Speaking of HP, expect Joltik and Pumpkaboo to be OHKO’s; at times players have bothered with tricks to up their HP, but it is usually just better to accept they are glass cannons. Both are vulnerable to T1 KO’s, at least against the few Expanded attackers or effects capable of KOing something on the overall first turn of the game, and Weakness only matters against the softest hitting attackers, as the two are easy OHKO’s even for attackers which have to deal with their Resistance (though its presence is still appreciated). Typing matters only for exploiting Weakness and having to deal with Resistance when it comes to Joltik; Pumpkaboo would be the same except it desperately wants you to have Dimension Valley in play so it can attack for [CC] instead of [CCC]. Night March before any effect other than what is built in, Night March can do as little as no damage or as much as 240, though that high assumes you have something like Marshadow-GX so that you can attack with all Night Marchers in your discard pile. Marshadow-GX also allows you to exploit [F] Weakness. Having something that can use Night March without having Nigh March printed on the card is an old trick for the deck. Mew (XY – Fates Collide 29/124) and Mew-EX were once a common sight in Night March decks, but have fallen out of favor with current builds. The deck almost always includes Pokémon-based draw to go for as fast an opening as possible; think of the usual options like Octillery (XY – BREAKthrough 33/162), Shaymin-EX (XY – Roaring Skies 77/108; 106/108), and/or Oranguru (Sun & Moon 113/149; SM – Black Star Promos SM13). Once Tapu Lele-GX released, it joined the ranks. The deck tends to run a LOT of Trainers, always including Battle Compressor (good for up to +60 damage via Night March), Professor Juniper or Professor Sycamore, and Ultra Ball, but often having a wide variety whether we talk the deck’s own setup or disruption. Night March usually runs on Double Colorless Energy and just Double Colorless Energy, however, there have been successful exceptions. For example, Bronzong (XY – Phantom Forces 61/119; XY – Black Star Promos XY21) was used to fuel a wide range of [M] or [C] fueled attackers, and a Night March variant was among them. Night March sometimes partners with other attackers as well. Flareon (BW – Plasma Freeze 12/116), a.k.a. Flareon [Plasma], Vespiquen (XY – Ancient Origins 10/98), and I think even both at once have partnered with Night March, as they also have attacks fueled by the discard pile. While Standard-legal, Night March shaped the metagame… at least, after Lysandre’s Trump Card was banned; before that, Night March struggled against easy resets. Night March was the favorite to win the 2016 Worlds, but instead, the top decks won by having strong Night March matchups. How about the deck’s Expanded Format run? At first, it wasn’t too different from the Standard Format performance of the deck. At various times, Night March was predicted to be over, most notably when two cards were released that are almost perfect counters for Night March: Karen and Oricorio (SM – Guardians Rising 56/145; SM – Black Star Promos SM19). Karen is the nerfed version of Lysandre’s Trump Card. Lysandre’s Trump Card was a problem for gameplay in general while it was legal, but was especially frustrating for decks that relied on a discard pile-based approach. While Lysandre’s Trump Card would toss all the cards you used as part of your initial setup back into your deck, where you could reuse them and did this to both players but what if your opponent’s side of the board didn’t need its discard pile to hit hard? What if you used Shaymin-EX even more heavily than most decks, so you might not have any being recycled and even if you do, you may no longer have the Bench space for them? Karen does not recycle Trainers or Energy, only Pokémon; this keeps your opponent from potentially throwing their entire deck at you turn after turn. Oricorio is much simpler to explain. Though it is only a 90 HP Basic, with that worrying [D] Weakness, it has [F] Resistance, Retreat Cost [C], and two attacks that only require [C]. The second attack only barely matters, so we’ll get it out of the way: “Revelation Dance” does 30 for [C] BUT only if there is a Stadium in play. The real deal is the first attack, “Supernatural Dance”, which also only costs [C]. Supernatural Dance lets you place a total number of damage counters, equal to how many Pokémon your opponent has in their discard pile, onto your opponent’s Pokémon. You can distribute them how you wish, dumping them all on one, spreading them out evenly, or something in between. While there are cards that protect your Bench from such things, it isn’t as easy to block damage counter placement as it is to block damage to the Bench. With Night March wanting a good seven or eight Night Marchers in the discard pile so that a Choice Band or Muscle Band equipped Night Marcher can OHKO your typical Basic Pokémon-EX/GX, there’s a good chance Oricorio can take out at least two of your attackers with one shot. The Oricorio player may even be able to attack for no Energy, thanks to Night March usually running Dimension Valley, and besides taking multiple Prizes, you might leave your opponent left with no Night Marchers outside of the discard pile! The thing is, Night March is not dead! Night March has always had a few favorable matchups, but what made it so good for so long was having no truly bad matchups. It had a slight edge or was “even” with the other decks it faced, due to taking OHKO’s rapidly, reliably, and repeatedly. In many ways, it is now the gatekeeper of the Expanded Format. To paraphrase Ryu’s famous win quote, “You must defeat Night March to stand a chance!” when it comes to Expanded. How do decks do that other than with these counters? Including one or two copies of a card isn’t always reliable, even with Rescue Stretcher to recycle Pokémon or VS Seeker to reuse a Supporter over and over again. What you see when you look at the top decks in Expanded are tactics that cause problems for Night March already present, and sometimes supplemented with Karen and/or Oricorio. Night March needs to stream its low HP attackers while taking rapid, reliable and repeated OHKO’s AND winning both the Prize and resource exchanges. What frustrates that? As of writing this, Limitless doesn’t have the entire top cut from the recent (October 27th) Regional Championship in Portland, OR. It DOES have the top eight and we see no Night March. Three Zoroark-GX/Seismitoad-EX decks, one Trevenant BREAK deck, one Archie’s Blastoise deck, one Primal Groudon-EX, one Garbodor (XY – BREAKpoint 57/122)/Garbodor (SM – Guardians Rising 51/145) deck that oddly had an older Garbodor (BW – Dragons Exalted 54/124; BW – Plasma Freeze 119/116; BW – Legendary Treasures 68/113) in it as well, and one Buzzwole/Buzzwole-GX/Landorus-GX deck make up the top eight. Two of those decks ran a copy of Karen and two different decks ran a copy of Oricorio, but all are decks that have favorable or even matchups with Night March, as they have a tactic devastating to Night March. Not just one tactic, either, but most have two. Zoroark-GX and Primal Groudon-EX are hard to OHKO. Articuno, Buzzwole, Garbodor w/Trashalanche, and Trevenant BREAK are single Prize attackers with either budget attacks or Energy acceleration to still be speedy, and most of those are Basics as well! The Articuno even has an Ancient Trait that lets it take an extra Prize when it scores a KO, reversing Night March’s usual Prize advantage! Garbodor (with Garbotoxin) and Wobbuffet shut down Abilities. Seismitoad-EX and Trevenant (XY 55/146) provide one-sided Item-lock. Buzzwole-GX, Landorus-GX, Trevenant BREAK, and the regular Trevenant enjoy bonus Bench hits or full-on damage spread! Frankly, it is no wonder people think Night March is dead, but it is still chugging along. I didn’t have enough time to get a sample of significant size, and even if I did, I wasn’t keeping careful records, but I put a modern version of the deck through its paces. The last time I’d seriously used it, cards like Ghetsis and Hex Maniac were legal, and allowed Night March to try for some nasty early-game disruption on top of everything else it has going for it. Puzzle of Time was legal to recycle Double Colorless Energy or anything else you needed to use again. Simply put, the deck was still decent; my build was forced to run a lot of cards as singles and that hurt reliability, and I kept slamming into decks with an advantage over Night March because, again, decks that don’t have a solid Night March matchup probably can’t handle anything above Night March. Adding to the above list of problem matchups are Greninja BREAK decks and Volcanion decks. I’m not sure how competitive either is now, but I’ll explain why they should worry Night March. Greninja BREAK decks usually combine a one-sided Ability-lock with a reasonably beefy single-Prize Pokémon that swarms and has an Ability-based Bench hit. Giratina (XY – Black Star Promos XY184) is a hard-counter to BREAK Evolution decks, but it is dead weight against anything else. Volcanion-EX is a solid attacker in its own right, but its “Steam-Up” Ability can easily increase the damage done by any Basic [R] attacker… like Volcanion (XY – Steam Siege 25/114; XY – Black Star Promos XY145), a 130 HP Basic Pokémon whose “Power Heater” attack does 20 while attaching one [R] Energy from your discard pile to one of your Benched Pokémon twice with each attack. Turtonator-GX can OHKO a Night Marcher using its “Shell Trap” attack, at least with a Steam-Up behind it… and the effect of Shell Trap then OHKO’s a Night Marcher attacking that Turtonator-GX. Yet, the thing that worries me most is a card we hyped up but never saw deliver: Lysandre [Prism Star]. It is a once-per-game trick that uses up your Supporter for the turn but not only could it permanently reduce the max damage of Night March by sending Night Marchers to the lost Zone, it can also banish your Double Colorless Energy, clutch TecH cards, etc! For the Limited Format, things are iffy; if you fail to pull cards like Battle Compressor or Professor Sycamore (both Uncommons) then the only way to get Night Marchers into your discard pile is through them being OHKO’d. Unless they changed it on me when I wasn’t looking, the 4-Copy Rule doesn’t apply to Limited Format Events; if you pull more than four of something, you can run them all! Dimension Valley and Double Colorless Energy are also Uncommons in this set but remember you may run into Lysandre’s Trump Card as well. The future of Night March might get a bit brighter with SM – Lost Thunder, because of the new Zebstrika. Its Ability lets you discard your hand to draw four cards. This gives you another Bench-sitting draw option worth only one Prize, but also a way to discard Night Marchers from your hand. The above scores, if it isn’t clear, are collective; so far, it has never been worth running anything less than all three Night Marchers at the full four count. They also aren’t strong individually or even all together, but are enhanced by so many other cards. I still haven’t done the full history of Night March justice, but I hope you can now appreciate it isn’t a brainless deck, and it also isn’t the powerhouse some may remember, yet it isn’t dead after at least two nearly direct counters were released. Even if you hate Night March, you need to build it because countering properly requires understanding it. It might get a bump with SM – Lost Thunder, and the “Lost March” attackers from that set may give you a case of deja vu.